So a little while ago I got my hands on some TCHO dark chocolate and proclaimed it amazingly the best. My good friend matthew has decided to challenge that statement by sending me a care package of chocolate!!!! yum now THAT is what I call a good friend!! tasty!!! He sent me two varieties. 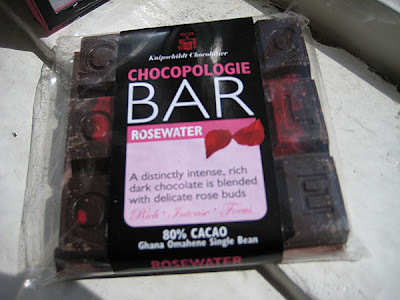 The first is a rosewater bar by chocopologie. I'm not sure what matt has to say but I think the rosewater was a bit overpowering in this one. Even though it was 80% cacao it really didn't have a definet chocolate or even bitter taste. Good to the no bitter, ehh to the not powerful chocolate. I mean come on if I'm eating a chocolate bar I want it to taste like chocolate and not just rosewater :) So sorry matt TCHO still beats out this one... Now on to the next!!! 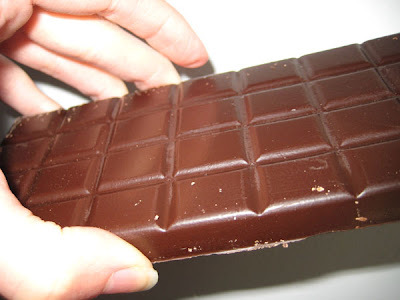 Next was a cherry chocolate bar by Eve kitten. This one had a less potent cherry flavor, it was more light and flavorful and added to the chocolate instead of overpowering it. 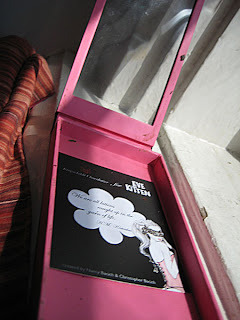 Plus Eve Kitten surely wins on packaging. I mean look at the cool box it came in!! 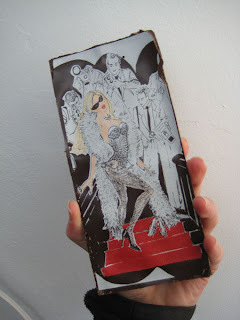 And the screen printer scandalous lady on the back of the chocolate... fantastic! Now I want to go eat some chocolate. update: so the eve kitten is a little side project of chocopologie (for those who want to know) also this place is considered one of the top 3 chocolitiers in the world!!! crazy man!!! Wow, if I blog about chocolate, will people send me free stuff too? 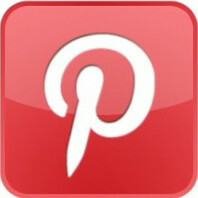 I'll be on the lookout for yummy stuff from this neck of the woods and let you know if (when?!) I find it. And more chocolate comming from Blake! Cant wait to see what the verdict will be. I got the TCHO also (Yummy) and also won the Amano chocolate. :) We are lucky!! !